I love chili. It's such a perfect meal for these cooler autumn evenings. It's spicy, filling and totally belly warming. What I like about this recipe in particular is there isn't much fuss or bother here. 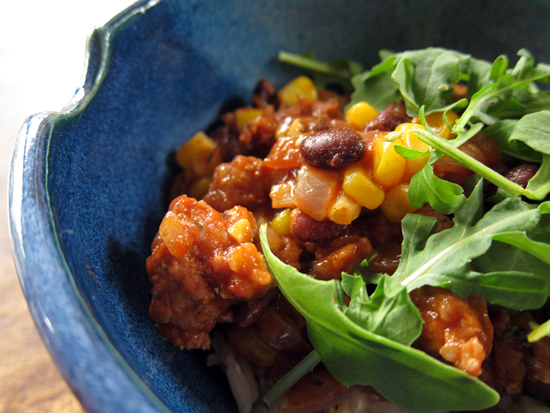 It's an easy weeknight chili that doesn't need a whole day on the stove to simmer. It gets a lot of it's kick from some spicy Italian sausage (or sub in some veggie ground round if you want a no-meat affair) and then there are the usual spices to help round out the flavours: red chill flakes, cumin, chill powder. And if you're feeling like you need more heat, shake in a few dashes or twelve of your favourite hot sauce. Chili is hearty fare and can get weighed down with guacamole, sour cream or grated cheese. Instead, let me introduce you to arugula. It's one of my favourite greens and it adds a peppery fresh bite to this meal. So much so that I beg you not to leave it out. I know, it seems like a throw away - just a topping - but trust me, the arugula adds a welcome and refreshing bite to this dish. This meal can be made vegetarian by leaving out the sausage and adding a package of veggie ground round just after adding in the tomatoes. Heat oil in a large skillet over medium heat. Add in onions and garlic and let them cook until wilted, 5 minutes or so. Add in the crumbled sausage and the spices, stirring often until the sausage browns. Stir in the tomatoes, stock, and black beans and let simmer for a bit until bubbly. Add in the corn and let that heat fully, stirring well. Adjust seasoning if necessary – this is where I usually shake in some hot sauce for good measure and maybe some salt if needs it. 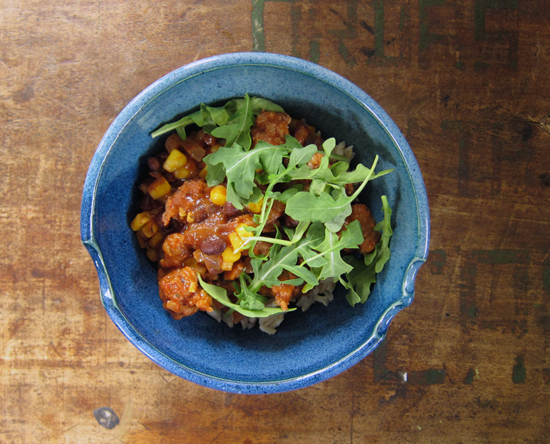 Serve chill over brown rice or your favourite grain and top with a handful of arugula. Makes 2-3 servings and can be doubled easily. 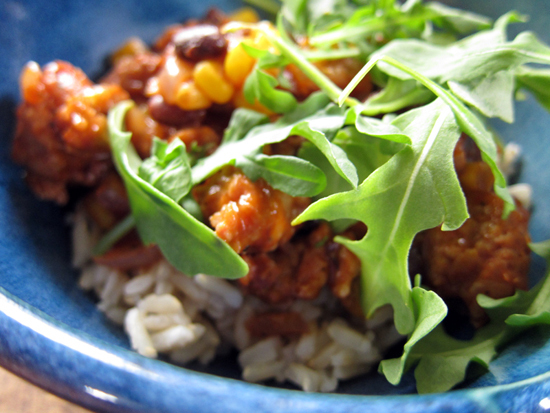 Arugula is my favorite leafy green ANSI would have never thought top air it with such a hearty meal like chili, but now it sounds so wonderful!